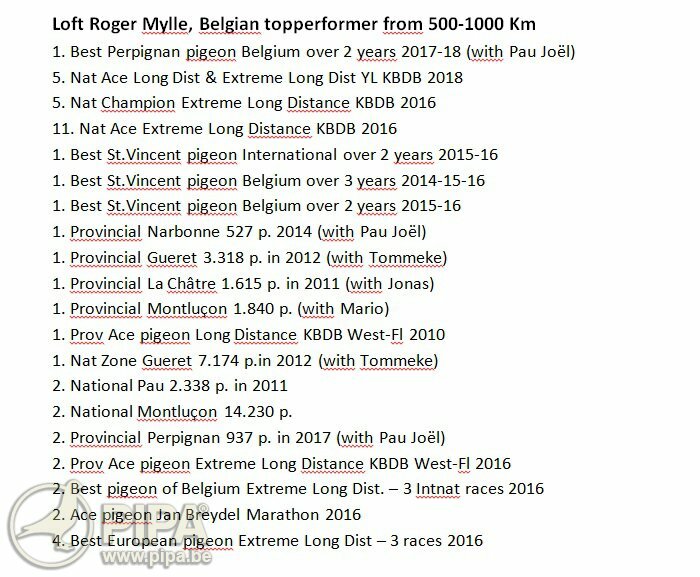 Roger Mylle is a top-tier fancier in Belgium with several national championship titles KBDB in the extreme long distance to his name. This breed has been highly successful in the international extreme long distance races in particular. His success story is based around a solid team of breeders, carefully crafted by a very skilled fancier. This team consists of descendants of some outstanding extreme long distance racing birds. Roger knows from his professional experience that it takes top quality ingredients to create a top quality product. Roger runs his pigeon breed toegether with his partner Jeanine, and they are getting great results every single season, and they win national championship titles regularly as well. 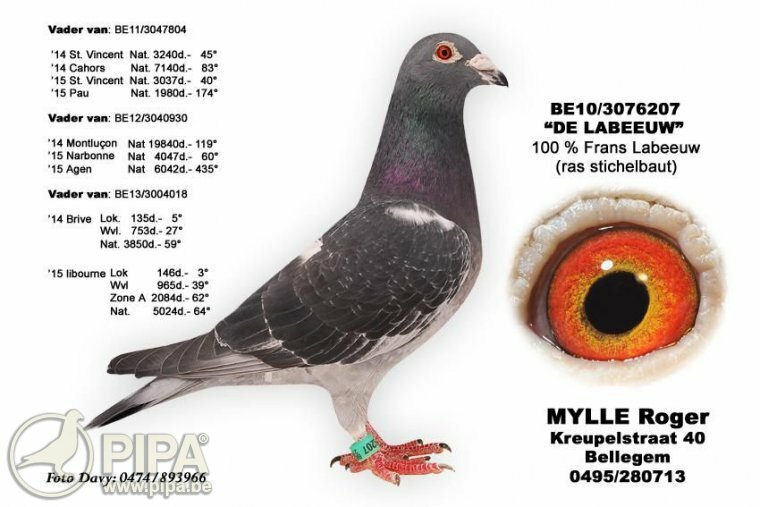 Despite the particularly demanding season, the modern-day Mylle pigeons found themselves in the spotlight again in 2018. Roger Mylle has been working hard on the potato fields of his parents from an early age. And he gradually developed a passion for the world's most popular tuber: the potato. He got his passion from his parents, two born and raised farmers. Roger then gradually got involved in the world of trade, working as a distributor for agricultural products, eventually focusing on the potato trade specifically. It had been his dream to launch a completely finished potato product one day. 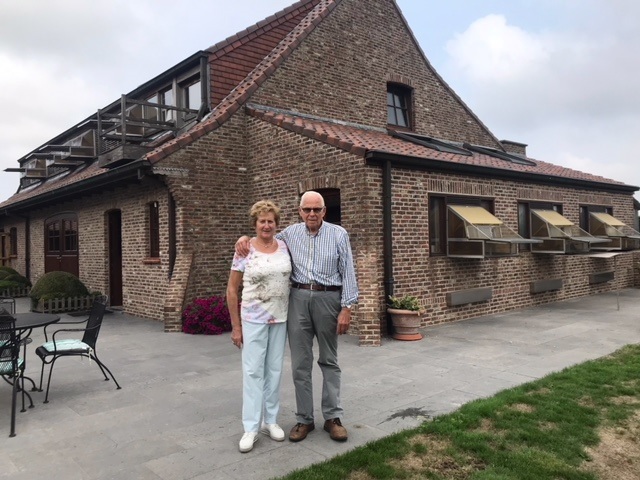 And in 1988, Roger founded the Belgian Mydibel company, with the help of 30 years of experience, a lot of determination and a sense for adventure. He worked passionately and his company eventually became an international player on the market. In 2009 Roger decided to hand over the company to his sons Bruno and Carlo Mylle, who have worked hard to turn Mydibel into a dyanmic and innovatie family company, which is now active in more than 100 countries. 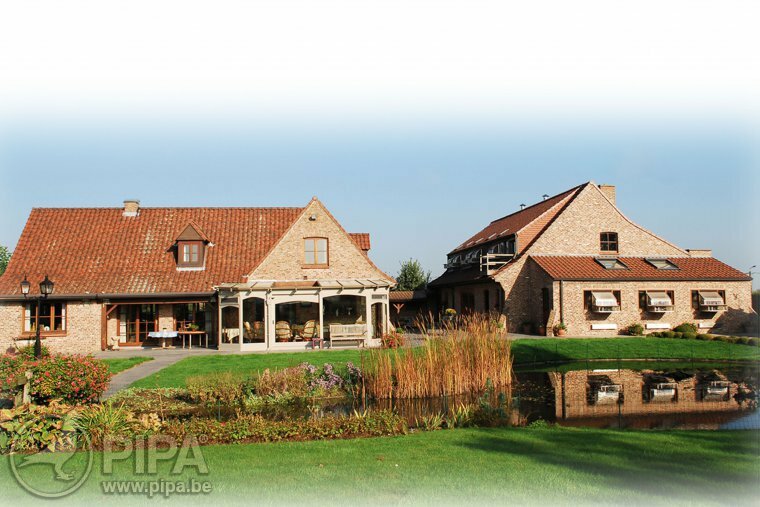 The old farmhouse next to Roger's house has been turned into a B&B, and the 'Bintje farm' is a well-fitted name for his guesthouse. Roger and Jeanine have had some remarkable racing seasons over the past few years, with several victories at provincial level and in the zone, and some early arrivals in the national classics, including two national second places. They have also claimed several national championship and ace pigeon titles. Their remarkable palmares clearly shows that they have a collection of top quality birds in their loft, and we would like to have a closer look at their greatest stars in the long distance and the extreme long distance. 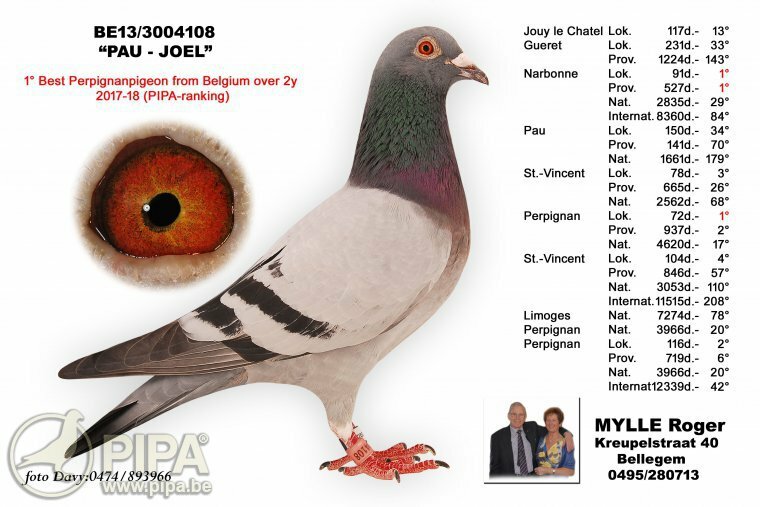 These are the pigeons that have turned the Roger Mylle pigeon breed into a renowned international team. Click here for the full list of achievements in St.Vincent. And De St. Vincent has some excellent origins. His sire is de Labeeuw BE10-3076207, one of the great breeders of this loft. He stems from the trusted long distance bloodlines of Aloïs Stichelbaut, and he was inbred to the Primus Inter Pares winner (5 x Barcelona) Montauban BE01-3121756. The dam of De St. Vincent comes from the loft of Geert Maroy; she is a daughter of a 2nd Interprov. Poitiers. It must be a joy to be breeding youngsters from such a talented bird. -Den Erik BE06-3174055: 6th Nat. Limoges 19,373 p., 11th Nat. Argenton 3,682 p., 51st Nat. Tulle 5,124 p., 1st Poitiers 324 p., 11th Prov. Limoges 2,300 p.
-Xavi BE08-9037436: winner of 1st Intprov. Souillac 786 p. – 37th Nat. 7,760 p. ’12, 2nd Prov. Argenton 1,209 p., 2nd Intprov. Souillac 646 p. – 36th Nat. 5,282 p. ’13, 12th Prov. Limoges 1,011 p., 44th Nat. Tulle 7,467 p., 55th Intprov. Cahors 1,302 p., 141st Nat. Souillac 7,045 p. ’10 etc. We have said it before: champions breed champions. Ata is a good example. And this Paul-Joël has some excellent origins as well: his sire – Mathieu Pau BE06-3003346 – won a 1st Pau 256 p. and a 2nd Nat. Pau 2,338 p., and his dam Super kweekster Verschoot BE11-3047921 originates from one of the stars of the long distance in 2017 and 2018: Joël Verschoot from Ingelmunster. Super Kweekster Verschoot is a granddaughter of the invaluable Red Opium (1st Nat. 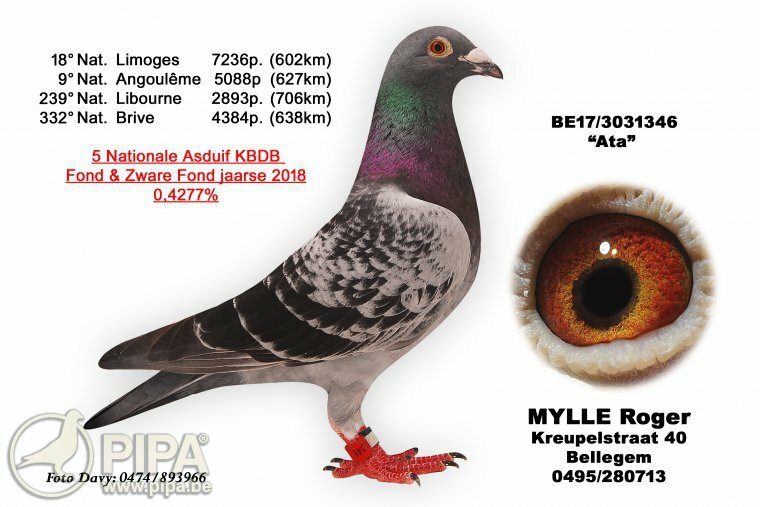 Ace Pigeon Belgian Long Distance Trophy) of Sylvere Toye, paired to a half sister of 1st Nat. 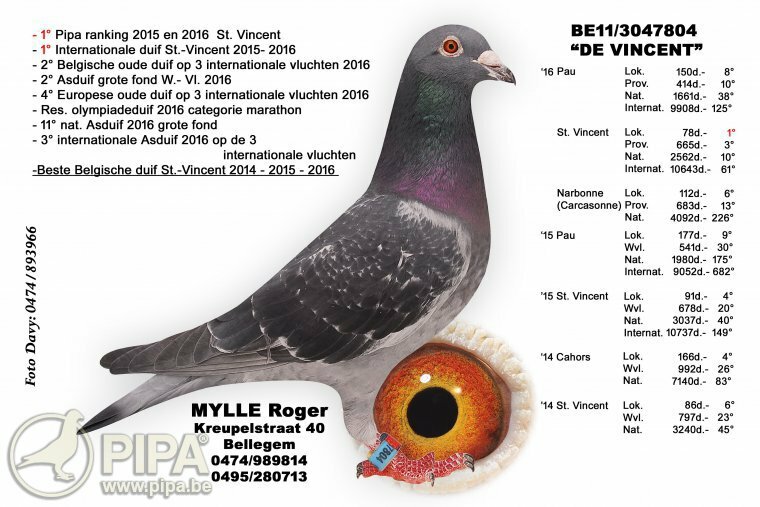 Bourges BE09-3127265 of Wilfried Vandemaele (from a half brother of Noël Lippens: 1st Millenium Ace Pigeon paired to the dam of a 1st Nat. Bourges). Roger went into retirement about 10 years ago, after working diligently for many years. However, he asked his sons to keep him up to date about the company, which he is still keeping a firm eye on. Together with his wife Janine, he is now enjoying his favourite pastime: pigeon racing. And we reckon there is a lot to enjoy: he has been getting great results pretty much every season, reaping the rewards of years of hard work. They have a breeding loft that consists of nothing but super class pigeons or direct descendants. And their descendants are now at the basis of this success story. They are housed in a fantastic loft equipped with modern technology. This is a mix of top class ingredients that have led to a fantastic product. It was thanks to these bloodlines that Roger Mylle was able to earn his place among the leading lofts at national and international level. And this team has a promising future indeed, with a group of top class pigeons with great potential. As long as his health allows, we except the modern-day Mylle racing bird to continue to shine in the national and international competitions. Congratulations!